In the developed world, we generally expect to have electricity, heat and transport within easy and affordable reach without thinking too much about how they got there. Nor can we do anything about it if we do not like the way they are organised, or if we worry about the consequences of today’s widespread energy consumption. This availability has often been achieved by government interventions, which tend to prioritise social control over energy efficiency. Their use of taxes or subsidies to keep the lights on without enriching the producers too much at the expense of the consumer, so that the market appears to work, can keep governments in office; or contribute to their downfall when they fail. Consequently most fossil fuel use is wasteful in both liberal democracies and so-called socialist states; and there is also natural resistance from the incumbents, always keen to play the scare-mongering card. This combination of factors makes it difficult to reduce carbon dioxide emissions from fossil fuel use, according to a new book by Simon Pirani, Burning Up. Given the cost of entry into the market and powerful political and industrial resistance to adopting risky strategies, change will generally be slow. This risks frustrating the many and well-intentioned attempts at reducing carbon dioxide emissions before the so-called carbon budget is spent. Thereafter global temperatures will rise beyond the point of no return, the argument goes. Sea levels will rise and crops fail, driving huge migrations as people move in search of land and food. And such rapid transitions in energy policy that there have been, have not generally sprung from fears of global warming, so much as from supply fears. This was the case with the French decision to rely on nuclear power for its electricity, as the government of the day wanted to avoid imports of fossil fuels. Looking back, it was fortuitous that it was also low-carbon, the science of global warming then not even a consideration. Similarly the switch from coal to gas in China was more a solution to immediate and mounting health problems caused by airborne particulates. Pacifying the population was the driver, not limiting carbon dioxide emissions. But because so much political capital has been invested in renewable energy in Europe in particular and in the United Nations framework conventions on limiting climate change generally, there is a self-defeating temptation for governments to claim greater success than they deserve, which takes the edge off the urgency. “This pressure should be resisted. We should acknowledge the failure of the quarter-century-long process; soberly assess timescales; and base our hopes for the future on realities, not illusions,” Pirani says. 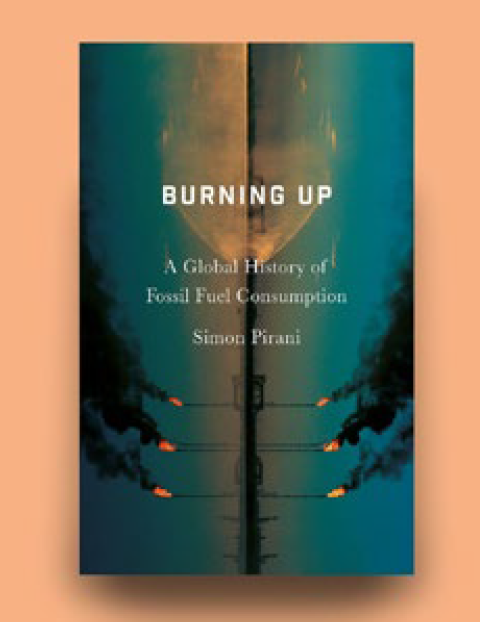 Combining political and moral philosophy, science, wide-ranging social history and statistics, and drawing on abundant supplies of published academic and other research, Pirani concludes that the only answer to the problem is a drastic rearrangement of energy systems. Otherwise they will continue to worsen the climate, he argues, while continuing to bring none of the hoped-for rewards, such as prosperity and happiness to the rest of the world. Much of it still exists in fuel poverty, doomed to burn wood and biomass that poison the atmosphere in the short-term. One key argument is that numbers of people do not affect energy consumption: dismissing what he calls ‘neo-Malthusian’ economics, he says that it is social, economic and technological systems that use resources; individuals do so through those systems which they can hardly influence: “There is no direct, arithmetic correlation between their consumption and environmental impacts,” he says, advocating a profound rethink of the way the business world works. The broad and deep research into policy decisions and social change in energy consuming and producing nations examines a vast array of data, such as the realities that lie behind energy consumption-per-head statistics and converts them into a multitude of readily comprehensible narratives. It considers the difference between discretionary and non-discretionary energy use, taking in en route the American love-affair with the car, and advertising that creates desires, that need energy in order to be fulfilled. It points out that household appliances have not freed us up to contemplate how to become better individuals; instead they enable us to spend more time doing other forms of drudgery, such as driving to the supermarket. Unintended consequences abound. The book goes back to before even the industrial revolution but devotes most of its analysis to economic boom and bust from the 1950s onwards, the so-called ‘great acceleration’. Of all the fossil fuels every consumed, over half were burned in the last 50 years. And fossil fuel consumption has grown fastest in the last three decades, in other words since scientists have said it is the main cause of global warming. Pirani analyses the relatively recent global attempts at slowing or arresting climate change from Toronto to Paris via Rio, Kyoto and Copenhagen. It shows up key examples of government mismanagement and deregulation, such as the California electricity market failure of 2001. Examples of enlightened energy policy of any political stripe are few in this book. He finds that even attempts at solving averting economic crises brought about by high prices or import dependency have left the main pillars of the structure in place, even if the architecture has changed over the decades. Industry must have low energy prices and secure deliveries and its interests come above all others if national economies are to grow. Pirani points out that rural householders almost everywhere and always have always been the last on the list for mains electricity connections. The way the argument has historically been framed, where higher GDP, industrialisation and urbanisation are taken as positives, closes down other avenues of discussion about how societies use fossil fuels and who benefits, he says. As a consequence pro-growth policies are assumed to be the only possible cause of the growth, while the significance of the negative side, such as financial crashes and harm to the natural world, is downplayed, along with the widening of social inequalities caused by that growth. Considering the notion of the energy transition, he says that the move to other forms of energy has already begun to take its first steps. The transition of social and economic models needed to reduce fossil fuel use however is still to come, and he proposes a number of ways in which that could be done. These depend on a radical shift in attitudes towards industrial agriculture, wage labour, manufacturing and the use of energy-intensive materials, which are all examined, along with other speculations, in thoughtful detail. But as history has shown so far, it is useless to expect this shift in attitudes to come from governments. Unless civil society can effect the social and economic changes needed, industry will continue to make a number of things that society does not really need, for others to transport some distance for a short period of use before their disposal, for all of which yet more energy will be needed. Civil society will, Pirani believes, succeed in this aim, eventually, by tapping into resources of solidarity and collective action that people might not have known they had. “The global warming disaster, which has been produced socially, on a much greater scale and over a much greater time span than other disasters, demands a collective response from us all that we… might not have thought possible,” he writes. Burning Up was published by Pluto Press in 2018 in a variety of formats including Kindle and PDF eBook. The 255-page paperback edition has the ISBN 978 0 7453 3561 2.